Cloth Diaper Cake Review & Giveaway from I Dream In Green! Today, I am here to tell you about one of my very favorite products I’ve tested for the Baby-Mama Shower Event. It is the ultimate eco-friendly baby shower gift, cute as all get out, and maybe the most useful gift you could receive (or give to yourself). What is it, you’re wondering? 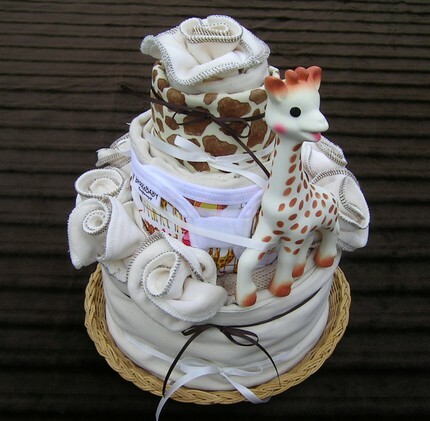 A cloth diaper cake from I Dream of Green. When I first heard about this business through Diaper Swappers, I was excited. After all, it’s an awesome idea but one I’ve never seen actually put forth by anyone. Who WOULDN’T be excited to receive something like this for a baby? Even if you don’t use cloth diapers, you will still use the contents in one of these cakes (prefolds make the best burp and dust cloths, and the cloth wipes in these cakes are so luxerious that you’ll want to use them for every possible body washing need of yours). 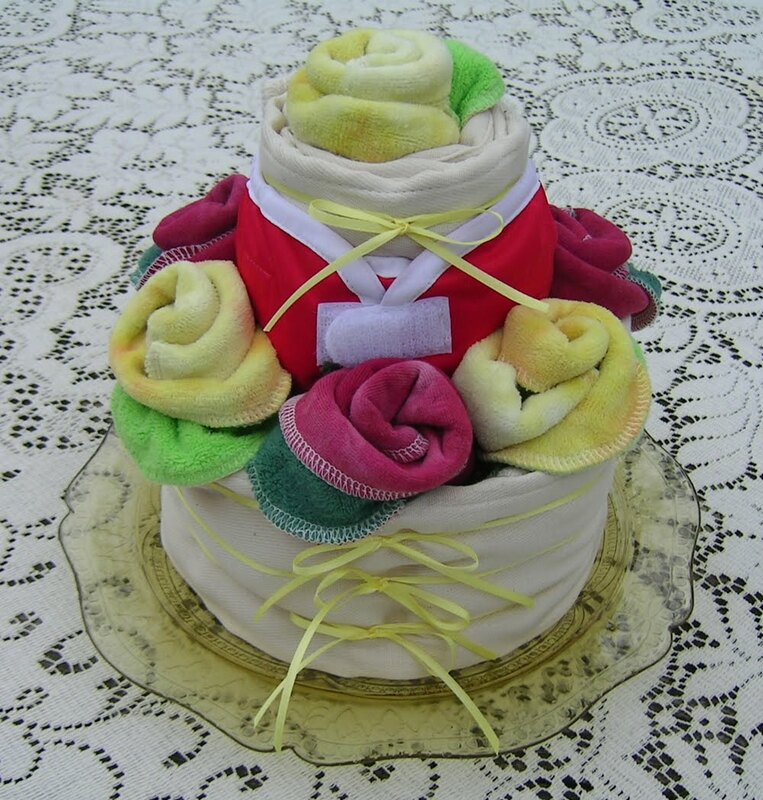 I Dream of Green is the business making these cloth diaper cakes, but the owner, Elizabeth, doesn’t stop there. She offers all sorts of awesome “green” creations including flower boquets and cupcakes, all made out of great quality, reusable cloth and baby-friendly items. I was able to choose items and try out a custom made cloth diaper cake for this review. The choices were endless and even when I changed my mind about things, Elizabeth was gracious to make sure everything was perfect for me–and it was! She will build a creation specifically for you, including everything from diapers and covers to teething toys and wet bags. The components of the cake she made for my soon-to-be son is: 7 Bummis organic cotton infant size prefolds, 7 double-sided hand-dyed cloth wipes, 1 XS Thirsties cover ($48.00 value total). That’s a LOT of stuff for a new baby, and it came so beautifully packaged that I actually couldn’t bring myself to unassemble the cake for about a week after I received it. 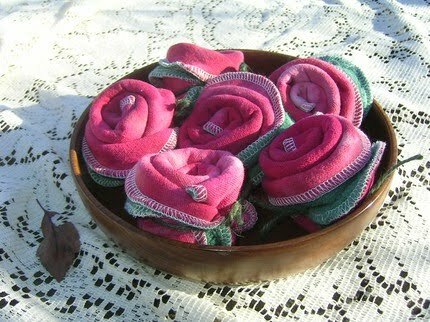 🙂 When I did finally start to pull it apart (very easy, by the way), my daughter had a blast playing with the “roses” (washcloths). She and I had lots of fun pretending to eat our pieces of “cake” for a few days before I unwrapped them for washing’s sake. 1) Owned by a mama who not only knows WHAT other mama’s and baby’s need, but who has access to a huge variety of earth and human friendly products to put into her creations. 2) Her creations are simply delightful to look at. This woman seriously pairs colors and objects together in a fantastic way. 3) The quality of the items! These are by far the BEST washcloths/wipes I’ve ever used. They’re double sided, colorful, just the right size, and SOFT. I’ve been using them to wash my face every day since getting them and I want more! 4) Everything she sends is reusable, right down to the ribbons. 5) She can make a great eco-friendly and useful gift for any new baby or mama–not just those of us who use cloth diapers! And since she’ll do custom work, your budget can definitely afford something. Buy It! Hurry, she has some ready-to-send items and a ton of custom slots. Visit http://idreamingreen.net/ to view the selection and to contact Elizabeth. Win It! I Dream In Green is giving one of my readers a $20.00 gift certificate good towards anything at http://idreamingreen.net/ (will be emailed to the winner and will be good for 1 year). There are a ton of things you can do to enter this contest (see below), but you first MUST be a Google Friend (Blogger) or Feedburner subscriber (email) of Life More Simply. Be sure to leave an email address and separate comment for each way that you enter below! Contest will end on or after May 7th, 2010 at noon, EST. Post here what YOU would want on a diaper cake if you were giving or receiving one. Tweet about this contest with a link @LifeMoreSimply and @dreamgreenshop. Tweet 1x/day! Grab any of my buttons and put them on your blog (1 entry/each). Note: I Dream In Green provided me with the samples to do this review. No other compensation was received and I was under no obligation to write a positive review. Medela Tender Care Lanolin and Hydro Gel pads Review & Giveaway! Spa Baby Eco European Bath Tub Review & Giveaway! I follow the IDIG blog. IDIG is now a favorite! She is a favorite of mine on FB and I plan on using her bouquets as centerpieces at my sisters baby shower! I would love to get a cake that has Dr Seuss items on it or a Red Sox themed one!!!! The next shower I am throwing the colors are rich/dark reds and purples so if I was to buy I would love something in colors like that with a xs cover and a snappi or two. I'm a follower and would love a cloth diaper cake!! Publically Follow the Etsy Cloth Diaper Team blog – DONE! Oh my…if I was building a diaper I would want OS pockets, doublers and wipes in the cute flowers with a wet bag thrown in. A cute natural toy would be great too! Her creations are really beautiful. My diaper cake would have some prefolds, some flats, maybe some hemp fitteds, some wool soakers, cloth wipes and a wet bag.